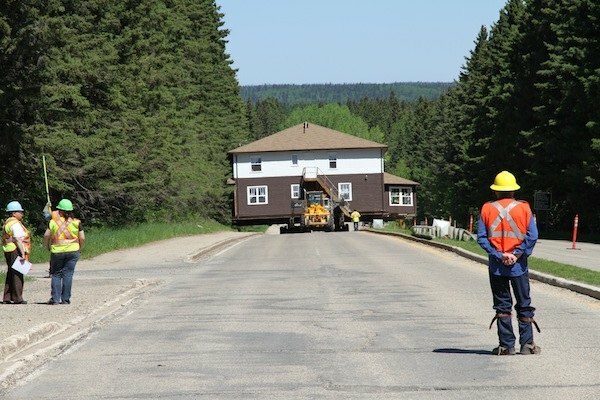 Clear Lake Lodge, which has sat at the corner of Columbine and Tawapit in Wasagaming, Manitoba since the 1950s, was moved on Monday to its new home. The lodge was recently sold and its owners have moved the hotel to a property on Highway 10 just south of Onanole. The plan is to reopen the lodge as a bed and breakfast by this fall. “We’re hoping this heritage building will find new life as a year round holiday destination in its new location outside of the national park but inside the RM of Park,” said Earl Shaurette, who co-owns the lodge with his wife, Cindy. The lodge will be located about 10 minutes south of its former location. Reservation inquiries can be made by calling (204) 848-1772.